Most of us know it's against the law to use a smartphone behind the wheel – but what about a smartwatch? A Pincourt man learned the hard way that police won't tolerate those either. Jeffrey Macesin received a $120 ticket and four demerit points after he was pulled over by the Surete du Quebec for wearing a smartwatch. Macesin said he was shocked when he was pulled over because he didn't think he was breaking the law. The self-described gadget lover said he thought he was permitted to watch his new Apple Watch while driving, so long as he wasn’t tapping away on his smartphone. “I have it in the bag charging while the auxiliary cable is plugged in to the radio and this controls my phone to play the music. So I was changing songs with my hand on the steering wheel,” said Macesin, who was leaving Pincourt heading to Highway 20. “Going towards Vaudreuil, there was a cop car behind me and he didn't have his lights on yet, but then he turned them on and I thought maybe he just wanted me to get out of the way. I was just confused,” he said. "No person may, while driving a road vehicle, use a hand-held device that includes a telephone function." Macesin argues that technically he wasn't using or holding a phone. “It's not so much handheld. It's a watch. You know, it's on my wrist. That's where it gets controversial. It's like, ‘Is it? Is it not?’ but I think this needs to be talked about,” he said. Lawyer Avi Levy specializes in fighting cases involving traffic violations. 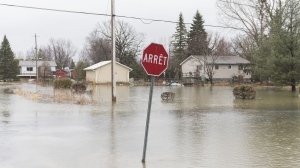 “I knew it was just a question of time before we got a case like this, but it definitely won't be the last,” said Levy, who said the wording of the Quebec Highway Safety Code leaves smart watches in a grey area. “I'm not convinced that the Apple Watch itself is a phone. It's rather a Bluetooth device that communicates a telephone signal from the phone and it has been established in the law that you're allowed to use Bluetooth devices and it doesn't constitute an infraction,” he said. Macesin is contesting his ticket and is considering hiring a lawyer to represent him in the case. Jeffrey Macesin was shocked to get ticketed for using his smartwatch while driving.